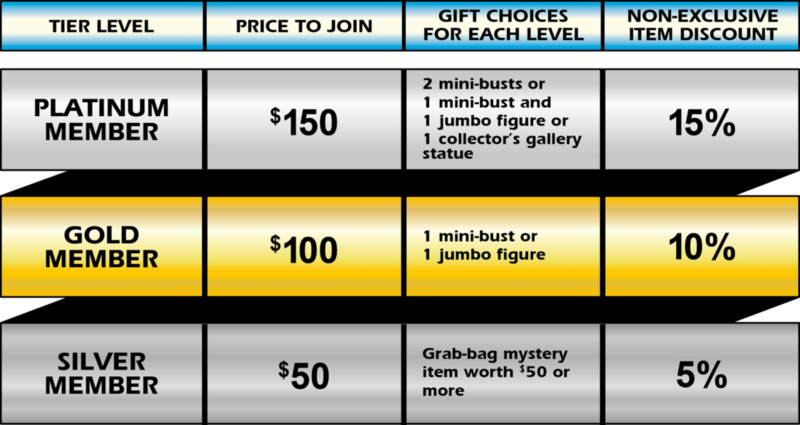 I’ve talked about Gentle Giant’s PGM program a number of times in the past, but in a nutshell you pay a certain amount for a year’s membership, which then entitles you to a certain number of “free” rewards (depending on the tier you select), as well as access to some exclusives, and some discounts on other products you might purchase during the year. If you’re interested in Gentle Giant’s stuff, it’s usually not a bad deal, since even if you’re not interested in any of the things that they have as rewards, you can pretty usually easily get your money back by selling them on the secondary market, while still enjoying the discounts, coupons and other exclusives available to members. They’ve changed the way the program works a couple of times, but basically you choose Platinum, Gold or Silver membership, and get the rewards mentioned below. Last year, I wasn’t super into the available choices, but I did end up joining largely to get access to the Bib Fortuna mini-bust. It’s a different story this year, though, since they have not one but two Jabba’s palace characters available as rewards. (There is also a Spacetrooper mini-bust, Cloud City Leia mini-bust, and Darth Maul statue available as choices.) 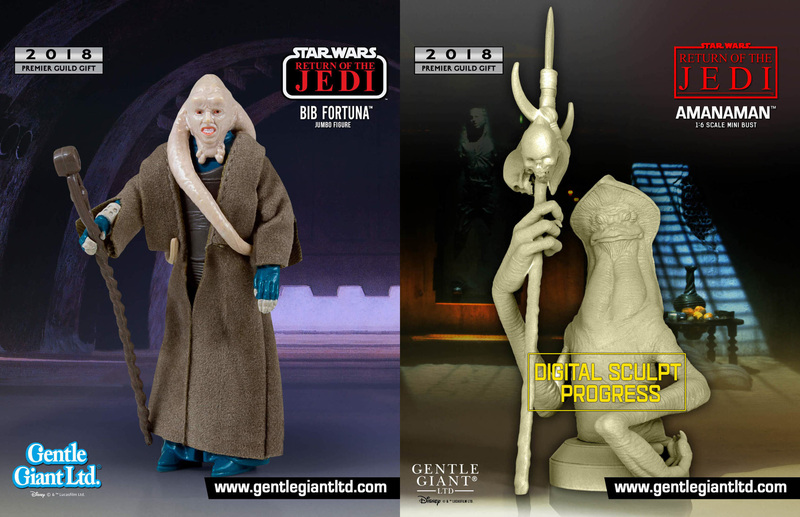 The first is the Jumbo version of the vintage Kenner Bib Fortuna figure, which should go well with the other jumbos they have released up until now. However, it just makes me wonder what happened with the Jumbo Jabba the Hutt figure even more. I checked back through some of my previous posts, and they first mentioned it in 2014, and I said that it was slated for 2015! Obviously that didn’t happen, and Gentle Giant has largely kept silent about it since then. If it’s not canceled, releasing this Bib Fortuna figure seems like a bit of an odd choice, since it would be a perfect companion to a Jumbo Jabba. The Amanaman bust is an interesting one because Gentle Giant recently did a survey of PGM members to see which character they would like made into a mini-bust. The choices were Amanaman, Ahsoka Tano, Count Dooku, Doctor Aphra and Ponda Baba. It ended up that Ahsoka took the lion’s share of the votes, at 53.95%, with Amanaman coming in a distant second at 17.57%. I was pretty disappointed in that result, since I have no interest in an Ahsoka bust, but would really like an Amanaman to help fill out my display of Jabba’s Palace mini-busts. I don’t know if they had always planned to make the second-place bust, or maybe they thought Amanaman would do better in the survey than he did (it’s interesting that they already have an in-progress digital sculpt of him, but haven’t shown anything of the Ahsoka bust as far as I know). But either way, I’m just happy that we are getting him in bust form after all. If you’re interested in signing up, you should be able to do so starting today on the Gentle Giant site, although as of this writing I don’t think it is available yet.